I met him on a short hill overlooking the road, some macho Welsh local covered in rain and dirt, pulling a beer from his poncho and waiting for the next car to wail past. I asked him why he had trekked into the woods, soaked through his boots, standing for hours on the side of a road, just to get sprayed with rocks from screaming, 300 horsepower hatchbacks. He wasn’t alone. I saw thousands of people that week doing the same thing. I had flown halfway around the world to find out why anyone in their right mind would be a rally spectator. 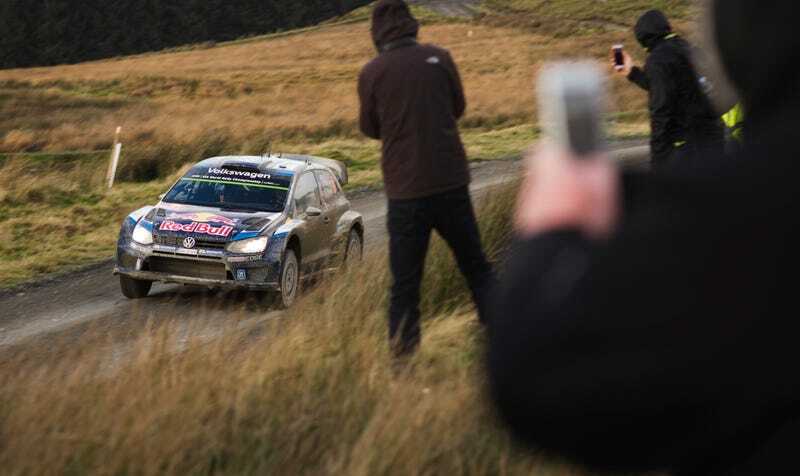 This was Wales Rally GB, the last round of the World Rally Championship, held on one storm swept weekend last November on the vowel-deficient nub sticking off the western side of Great Britain. It’s important to understand that rallying is possibly the most obsessively, methodically inane form of major auto racing. The face of it is that you take a regular road car, strip it, cage it for safety, modify it with insanely expensive suspension, custom all-wheel drive, and an extremely high-strung turbo engine. Then you race the car on real public roads, which rally organizers have closed for safety. But the thing is that these cars don’t race against each other; they race against the clock. Cars run one by one, spaced out one, two, or even three minutes apart. The roads they race on, typically twisting forest logging tracks, are by necessity in the middle of nowhere. Most of the time the competing rally cars are simply driving from one section of closed road to another. On the road sections, the cars are only trying to adhere as closely to as schedule as possible. You are penalized for going too fast. You’re not allowed to, because then you would be breaking local speed limits. So out of a whole weekend of racing, the cars really only race flat out for a very short period of time, and then they only race in the middle of absolutely nowhere, and since they don’t race wheel to wheel, you only see them go by one at a time with no clue which driver is the fastest, or who is winning. Just zoom, car goes by, wait a minute, zoom, another car goes by again. You need to invest the better part of an entire morning to see the field of cars pass you a single time. You’d think nobody would even show up to watch. And yet, I kid you not, thousands upon thousands of people trekked out into the Welsh forests for this rally. Wales was not kind to them. Whatever the opposite of fan engagement is, this is it. I remember standing on top of a dam, in 40-mile an hour winds that had long since torn my poncho in half, being pelted with stinging rain blowing up the face of the dam and directly into my face. I stood there for several hours waiting for the top drivers to pass. They were only in view for a few seconds at a time. That was only a single morning on the trip. Watching a rally like this requires driving hundreds of miles criss-crossing Wales, from one remote forest to another. I (and everyone else I talked to following the rally, from locals to tourists coming in from all over Europe) was up early and home late. Too hot and too cold, never dry, stained with mud and exhausted. The tea was good, at least. In and of itself, watching a rally is a horrible experience. It would easily put itself in the running for the worst sport to watch in the world, and that’s leaving the deaths aside. A Lancia 037 cuts through a sea of Portuguese spectators. Watch the full video here. The deaths. You can’t talk about rally spectators without talking about the cars and the fatal crashes of the 1980s. From ‘82 through ‘86, the World Rally Championship ran a new Group B category that almost completely removed its restrictions on the kinds of cars companies could enter, so long as they built a few dozen road car versions that ordinary (but rich) people could buy. At no time did the WRC attract more fans out onto the stages. With nearly no limits, these Group B cars got insanely fast. As they got fast they got popular, and as they got popular more and more manufacturers got involved until you had huge budgets running rally cars almost as quick as Formula 1 cars of the day, with huge swarms of people coming out to see the sheer spectacle of insanely expensive supercars shooting fire and ripping down some random country road. It did not take long for companies like Audi, Ford, Lancia, and Peugeot to build cars for the series, and even Ferrari and Porsche had designs they were ready to enter before the series got shut down. Why did it get shut down? Because a lot of people died. Walter Röhrl’s Audi Quattro cuts its way through a sea of Portuguese spectators. Watch the full onboard here. No rally ever had more unruly spectators that in Portugal, and at the 1986 rally there, one Ford lost control and plunged into a crowd on the side of the road. Some 30 people were injured and three died. Later in that season one of the top drivers, the young and promising Henri Toivonen, missed a turn, flew off the road, crashed into a tree, and caught on fire when his fuel cell ruptured. He and his co-driver Sergio Cresto burned to death. These were only the final fatal crashes in a longer run of terrifying wrecks, near-misses, and worrying complaints of fatigue from the drivers. 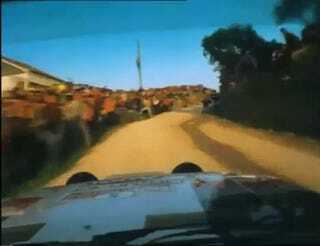 Rallies in the ‘80s were very long and grueling events, made more difficult for the drivers by their overpowered cars. Even more difficult was that they had to drive through seas of fans playing chicken with them standing in the middle of the road. Video from the time is harrowing. The organizing authority on the WRC cancelled the Group B category for the following year, reduced the speeds of the cars, and crowds eventually calmed down. The attitude among rally spectators now is that those were the Bad Old Days of rallying, as far as safety is concerned. The cars were spectacular, but Group B was a regrettable mistake. The walls of fans lining and blocking roads in the ‘80s are bittersweet memories, and everyone seems to agree that those fans must have been adrenaline-junkie idiots. Rally fans are more mature today, as all of the old timers I talked to were keen to mention. But that’s hard to agree with when you take stock of how many fatal crashes the rally world has seen over the past few years. Six spectators were killed at a rally in Spain only a few months before I flew in to Wales. In the years before that, three more were killed in Estonia, another three died at a rally in Scotland, and two were killed and 15 were injured when a car missed a turn at a rally in France. There’s more. A lot more. But the fans keep coming. To begin to understand the rally spectator, you need to put yourself in their shoes. Your day would go something like this. You wake up before dawn, and you drive hours away from civilization to some patch of woods. Many other rally fans woke up even earlier than you did and got all the good parking spots, so you park your car on the side of a dirt road a half hour away from the action. Once you hike onto the road and find a spot to watch, you need to figure out how to entertain yourself. The first thing to do is drink. Since you arrived early, you have hours before even the first rally car will even pass you, so there’s plenty of time to take the edge off with some whiskey. Now is also a good opportunity to join in with other nearby fans complaining about past times when you all went rally spectating. Did your favorite driver crash? Is your favorite car running faster than its competitors? You have no clue! Before the cars come by, one set of officials comes through in a van and warn everyone to stand farther back from the road. You, over there, you’d get killed if you stood that close. Same for you over there. And you all sitting down over there. After that van goes by, there’s some more waiting, another van with another set of officials, and then even more waiting. Except this time you hear it: the cars. Modern WRC cars get 300 horsepower out of tiny 1.6-liter four-cylinder engines; the motors are about the size of your average economy car but vastly more powerful. To get that output, they need huge turbochargers, and to make those turbochargers work, they need what is called anti-lag. It’s a system that dumps unburnt fuel right into the exhaust to keep the turbo spooled up. It’s destructive and expensive, but when it works, it shoots flames out of the car’s exhaust and it cracks and bangs like a assault rifle. Pictured: not a WRC car, but rather a lower-spec Citroën. It’s still fast enough to kill you. Photo by author. This is the real draw. I mean, you have no clear or real time updates on where your favorite driver sits in the standings in the moment. Did your favorite driver crash? Is your favorite car running faster than its competitors? You have no clue! You end up taking in the cars and the drivers and their speed in isolation. That’s been particularly true for the past few years, as the World Rally Championship has been completely dominated by one driver: Sébastien Ogier. He won the Wales Rally GB, along with seven other rallies that season out of a total 13 events. He won the championship last year, as he did the year before that, and the year before that. So as you wait for the action to start, after hours of waiting and drinking and warnings and more warnings, you hear these bangs echoing through the forest for miles before a car ever makes it past you. You’re a little buzzed, a little antsy. You forget the fatal warning issued by the rally officials, and with each bang you inch closer to the sound. By the time the cars scream past, you’re cheering and leaning right over the edge of the road, half terrified at what you’re doing and half wanting to get even closer. A nice weekend in the woods. Photo by author. You want to touch the oncoming cars. You want them to throw rocks at you. Break a tooth if you’re lucky. Show it to your friend. Feel like you were part of history. You want to get run over by them, long as you get to tell a story about it later. That’s the dad in the yellow hat, and his son is giving two thumbs up. Officials later told them to move for safety. Photo by author. Most of the other spectators I talked to weren’t outwardly crazy. Lots of locals seemed to spectate just because it was something to do. There was a guy there my age who was out with some buddies mountain biking around Wales and only happened to be in the same place at the same time as the rally. On one of the more rainy days, a couple guys in another mountain biking crew explained that if they weren’t here, they’d be outside in the wet anyway. The slop didn’t bother them. But, much to my surprise, it wasn’t only locals who were out in the Welsh muck. Cheap flights and close rallies clustered through Europe make travel easy. It wasn’t hard to find Polish fans sharing whiskey with Finnish fans walking by Italian fans at any spectator area. One British marshal I talked to told me that 20 or 30 years ago there’d only be the Welsh out at these stages, but now “the whole of Europe is here.” There were hundreds of people at any big corner I went to all through the weekend. The final jump at the Sweet Lamb stage, specifically set up to be spectator-friendly. Spot the flying car! Photo by author. What seemed like the majority of the spectators were watching the rally because they were involved in rally in some way themselves. They weren’t all drivers or co-drivers, but maybe they had seen a rally when they were young, or helped volunteer at a local event, or maybe they just owned a Subaru and dreamed of going fast like the pros. A typical view on the way to one of the morning stages. Photo by author. An old crew chief I talked to later that day had seen rally cars drive through his little village in Scotland when he was a boy and has been going to rallies ever since. He had his son with him now, too. There was every suggestion that the son’s son would someday be in the same position. A day earlier, I chatted with another father and son pair. He was in Wales on vacation and wanted to show the rally to his teenage boy. With plenty of time before the cars raced passed us, we talked lazily about the time he spent in Canada logging and as truck driver and field hand down in Texas. The van in question, letting us know we could easily die where we stood. Photo by author. The rally official politely reminded us that we were, in fact, standing in a particularly dangerous spot, exposed on the edge of the road, on the outside of a corner at the end of a long, slippery, downhill straightaway. If anything went wrong with a car, if it lost its brakes or broke a wheel or misjudged a corner or anything that is completely ordinary in a tough rally like this, we would be crushed to death. “If you die,” he intoned, “we’ll have to fill out so much paperwork.” He reiterated that if any other official saw us standing where we were, they would have to shut down this entire section of the rally. We all agreed to move somewhere safer, and the official drove away. I turned to march to some more protected spot back up the road, but the father and son instead walked directly away from the road into the dense, tall trees. They were in bright neon green rain coats, both of them. I asked them what they would do when the next set of officials came by, or where they would move to. In the moment it’s easy to understand, and it all kind of feels like it makes sense, and it’s so beautiful out here in the woods and the cars are so fast and so exciting and they’re professionals and I’m not like those other idiots and nothing will go wrong.